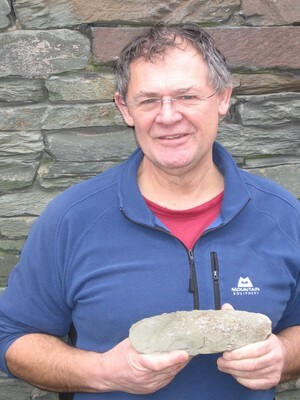 Mark Ward came over to the house and we talked about the Neolithic axe factory on Pike of Stickle. Seathwaite Tuff is a silica rich white volcanic rock that formed in a crater lake over a hundred million years ago. It appears as a two metre wide seam fifteen hundred feet above ground level in the Langdale and Borrowdale ranges in south Cumbria. It has similar qualities to flint and can be worked, using a harder material, to produce a razor sharp edge; yet its high silica content makes it far more durable and less prone to splitting and accidental breakage. For three thousand years it was used to manufacture axes that were exported throughout Europe. Such was their value they became status symbols: a form of currency, with highly polished versions often placed in the burial mounds of warriors and chiefs. At the dawn of agriculture these axes cleared the forests and changed the landscape of Britain forever. I know all this because I’ve just spent a pleasant couple of hours in the company of writer / photographer Bill Birkett; the second in three generations of legendary Cumbrian climbers who between them have opened up well over a hundred new routes graded in difficulty up to as high as E9. Bill was the photographer on many of their expeditions and his images have been widely published in magazines and climbing journals throughout the world. I’d come to talk about his first visit to the Langdale Axe Factory over thirty years ago. Sketched by Wainwright in the 1930s, its location on the steep scree-strewn slopes beneath the Pike of Stickle is only accessible to experienced climbers. On a winter’s day he and some fellow enthusiasts went along to explore it for themselves. The factory is a shallow cave alongside quarry holes and chipping points. Lichen doesn’t form on the tuff and the bright white scree on the approach contrasted sharply with the surrounding rock, as though only recently quarried. Evidence of industry was all around them. In one section they came upon a large round granite block, a hammer stone, surrounded by flakes of graded chippings: beside it on a small shelf in a recess were two palm sized boulders of white Scottish granite; smaller hammer stones that were used to shape the axes. The whole scene was so orderly, so perfectly natural it was as though the workmen had simply put down their tools and gone for a tea break. I’d asked Bill what made the axes so unique. He placed one in my hands. About eight inches long its main body was lozenge shaped; tapered and honed into a flat sharp edge. It was surprisingly light with its rough surface possessing a soft almost silken feel: the silica having the effect of giving it a plastic coating. Listening to Bill’s stories while holding an axe made locally over three thousand years ago from a substance produced when the world we know was still forming, was really quite something.